I walked out to see if the swans were still there. 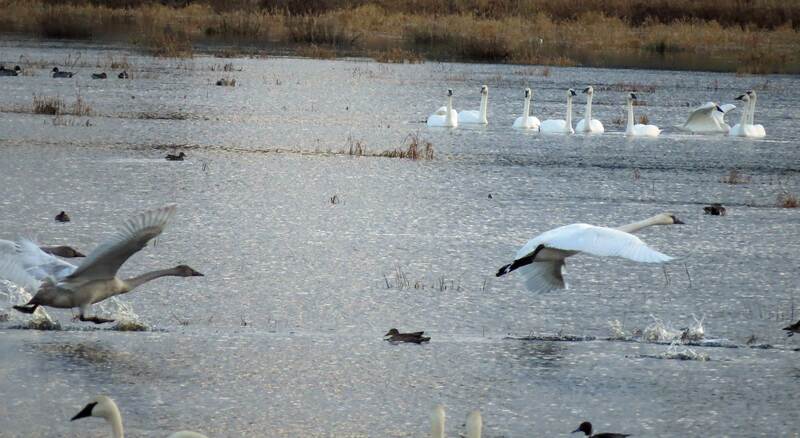 Well over 100 trumpeter swans arrived in the district the night before Christmas, even landing in the fields behind my house. Their chattering woke me up at 3 a.m., so close that I opened the window to check whether I was dreaming their voices. I walked to see them when the sun rose over the cold valley. That was days ago, and despite the chilly Fraser River winds that turned their lake to ice, they returned every night. The weather then changed, a Pacific storm ushering out the arctic air, and I could no longer hear them from the barn. The night was still warm with the visiting tropical storm, which pelted mountain snow with rain sending a surge of water downriver to flood the land. The unsettling warm winds rush toward the mountains, sliced by powerline wires and hissing and seething as they pass. There is moon almost full shining serene somewhere above the racing shreds of clouds. The swans were there. The wind drowned out their murmurs from the back door of my barn, but I could hear them as I walked the road around my neighbor’s run-down farm and approached the fence by old District 6. I decided the swans were a Christmas gift to me. These elegant, softly feathered birds with their inky black faces came at some godly behest to remind me that soon I will travel far north, as northerly as their summer breeding grounds. I will follow them home, to a place with fewer people and buildings and roads than this place. I once sat on a frozen bay along massive Lake Superior, gazing at the Northern lights shimmering across the sky. I sat huddled in a big ugly snowsuit, sorel boots, wool hat, and lined wool mittens. I was as lonely and bent toward the future as any teenager stranded in a foreign and isolated place. I wanted to be far away from trailers, cabins and shacks, the smell of propane heaters in ice fishing huts, and the choking fumes of diesel, gas and oil that ran chainsaws, logging skidders and snowmobiles. I wanted to run from a strange world of drunkenness and teen pregnancy and domestic violence punctuated seasonally by the puzzled eyes of well-appointed city tourists seeking natural beauty. If I could dissolve into light, I imagined, I could rise to the sky like the Northern lights and catch a ride on stratospheric winds to some faraway place where my mind’s eye could already see sunlight and hear laughing, chatter, music. Now I think about paying to travel to the Northern lights, take two planes to Yellowknife and sit quietly watching the sky, wanting the stratospheric winds to blow the loud, cluttered and bloated world far away. I want to sit huddled in a snowsuit and hide under a kaleidoscope of light, maybe stay there forever. This year I will pay to walk a long trail in the Arctic Circle. I will get there on a journey resembling travel in the 1940’s, not the new millennium: one plane that leads to another followed by a long boat trip on almost frozen waters to be left ashore on a barren coast. This place is not unpopulated with visitors, but not popular. I will pay to find a place as lonely as the place I fled decades ago. Today, I have swans. A gift of swans, a valley resplendent with swans. Silky white long-necked birds. Birds so large that gaining flight requires running on water with large black webbed feet while pumping long wings. They rest and preen, reaching remote itchy spots by retracting, stretching, and curling their necks to the tune of an invisible waltz, covering the water with snowy down. Then some swan gives the call to fly, and the staccato sound of feet slapping and wings pumping shoots across the water. The swan behind is still running on the water as it gains flight. Today, I have swans. For now. I say I won’t walk out every night to see them, but then the laughing moon smiles into my bedroom, and I open my window to let gentle honking and murmuring drift into the house. 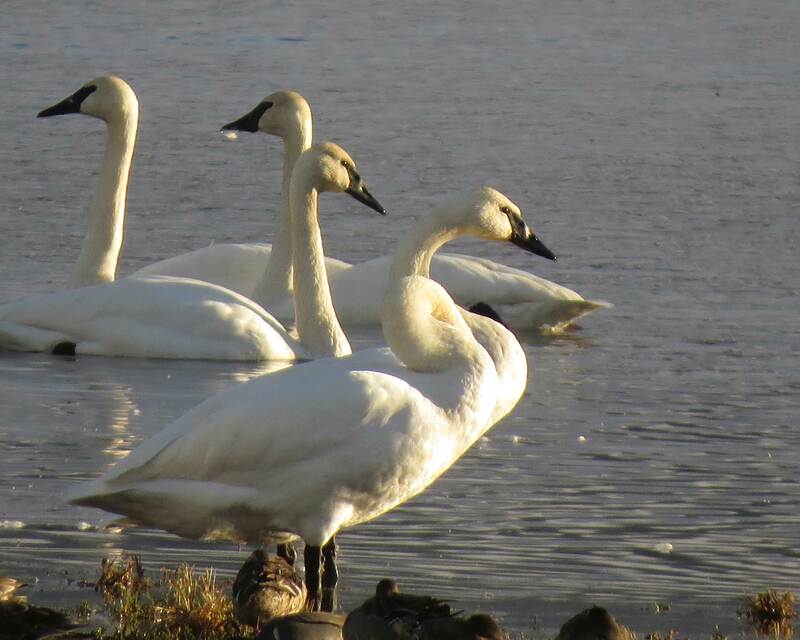 I put on a long coat over bathrobe and leggings, shoes over silly pink-striped socks, and walk the two miles to see the swans. The moon goes dim as valley fog rolls through, so I can’t see them when I arrive, but I hear them, talking amongst themselves, always murmuring, ruffling and preening. They will fly to the Arctic after the long winter night and the northern lights are gone there, and they may never return to my neighborhood again. But they are here, a gift, for now.